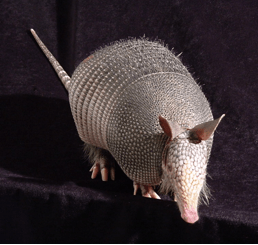 Nine-banded armadillos originated from South America, and expanded their range from Mexico into Texas in the 1800’s, eventually spreading north and east throughout the gulf states. People in Brazil, particularly in rural areas, hunt and kill armadillos as a dietary source of protein. In the small town of Belterra in western Pará state in the Brazilian Amazon region, a survey of 146 residents showed that around 65% of people had some contact with armadillos, through hunting, preparing the meat for cooking, or by eating them. A group of individuals who ate armadillos most frequently (more than once per month and up to twice a week) had a significantly higher antibody titer towards the M. leprae-specific antigen PGL-I and an almost two-fold higher risk of being diagnosed with disease, a significant risk. Response: When Dr. Richard Truman and co-authors at the National Hansens Disease Program (NHDP) in Baton Rouge, LA, first published in 2011 in the New England Journal of Medicine that 20% of armadillos in Texas and Louisiana were infected and passing this disease to humans as a zoonotic infection in the U.S., it was big news and made national headlines. Several studies by Brazilian researchers have tried to show this same relationship with armadillos in Brazil, but their evidence was weak or did not confirm this. Our study is the first to show that the same thing is happening in Brazil, with people likely being infected from hunting, preparing the meat, and eating these animals there, so the human health impact of our study on leprosy control in Brazil will be considerable when this paper is published. We found that 62% of the armadillos surveyed were infected with M. leprae, which is three times higher than the infection rate of these animals in the southern U.S., indicating a possibly much longer existence in this population, perhaps several hundred years. Response: The evidence for zoonotic transmission of leprosy from armadillos to humans in Louisiana and Texas was proven by using whole genome sequencing of M. leprae isolated from both patients and armadillos, showing there was an exact match of the strain type. There are two very specific genetic variants of M. leprae in armadillos, one in Texas and Louisiana (SNP type 3I-2-v1) and the other in a cluster of infected armadillos in central Florida in Volusia county (SNP type 3I-2-v15) that was identified in 2015 as crossing over to infect humans. Recently, the first known case of endemic leprosy in a young child in Florida was reported, with the only known exposure to the disease being contact with armadillos in the backyard. We are attempting to define the genetic type of M. leprae circulating in this area in Pará state to show that the type that is found in armadillos is also found in leprosy patients. Response: Best advice to avoiding contracting leprosy is to limit one’s exposure to armadillos. This work was supported by grants from Conselho Nacional de Desenvolvimento Científico e Tecnológico (CNPq grant 486183/2013-0 to MBS; 448741/2014-8 grant to Josafá G. Barreto; 481652/2012-4 grant to Claudio G. Salgado; and a Visiting Science without Borders award 402239/2012-1 to JSS), a post-doctoral grant from the Coordenacão de Aperfieçoamento de Pessoal de Nivel Superior (CAPES BEX 6907/14-8 to Moises B. da Silva, and 157512-0 to Barreto), a grant from Bank Santander (Brazil) Amazon 2020 program (to AHHM), CAPES PROAMAZÔNIA 3288/2013, a Fulbright Scholar to Brazil 2015-2016 award to John Spencer, and a grant from The Heiser Program of the New York Community Trust for Research in Leprosy, grant number P15-000827 and P16-000976 (Salgado, Stewart Cole, Mary Jackson, John Belisle and Spencer). Environmental approval of armadillo tissue sampling was obtained by SISBIO/44831-1. The authors thank Heiser, the Colorado State University Libraries Open Access Research and Scholarship (OARS) Fund, PROPESP/UFPA and FADESP for funding the publication cost of this article. The funders had no role in the study design, data collection and analysis, decision to publish, or the preparation of the manuscript. PLoS Negl Trop Dis. 2018 Jun 28;12(6):e0006532. doi: 10.1371/journal.pntd.0006532. eCollection 2018 Jun. da Silva MB1, Portela JM2, Li W3, Jackson M3, Gonzalez-Juarrero M3, Hidalgo AS3, Belisle JT3, Bouth RC1,4, Gobbo AR1, Barreto JG1,5, Minervino AHH2, Cole ST6, Avanzi C6, Busso P6, Frade MAC7, Geluk A8, Salgado CG1,4, Spencer JS3. This entry was posted in Author Interviews, Infections, PLoS and tagged armadillo, infections, leprosy, medical research by Marie Benz MD FAAD. Bookmark the permalink.